This entry was posted on Tuesday, March 7th, 2017 at 5:08 pm. If you’ve followed this blog for a bit, then you might remember a few of the posts I did on equestrian artist Milton Menasco. To give you quick refresher, Menasco was born in 1890 in Los Angeles, and began his career as an artist in Hollywood creating movie posters. By 1925, Menasco found himself in New York City as the art director of a film making company. Menasco, who then moved to Lexington, Kentucky, began to make a name for himself as an equestrian artist, and he had numerous clients including, John Hay Whitney, Isabel Dodge Sloane, President Ronald Reagan, Allaire du Pont, Arthur B. Hancock, Jr., Lucille Markey, and the Chenery family, for whom he painted Secretariat. You may also know him as the artist whose illustrations appear on the covers of the Black Stallion series! I love all of Menasco’s work, and I’m always looking for prints of my most favorite ones. I recently found Stymie online, and purchased him for $25! 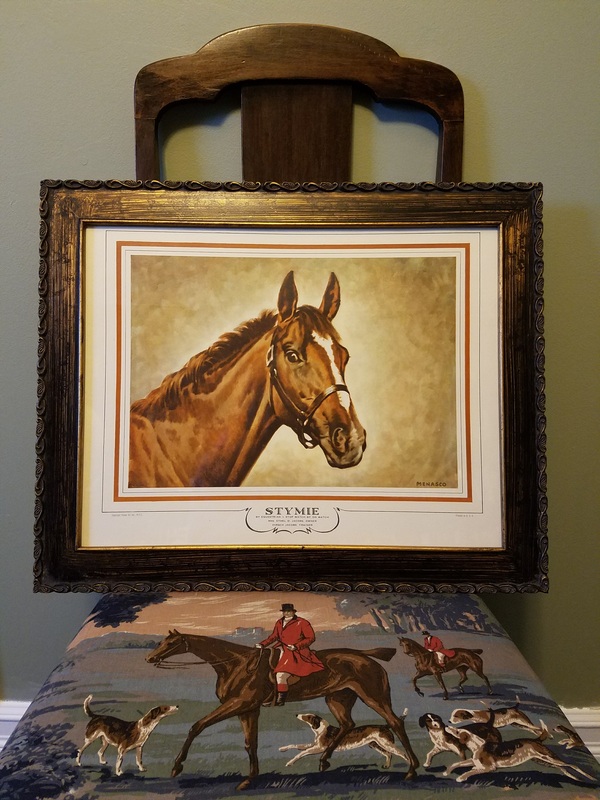 I found an old frame in my attic, cleaned it up a bit, and Stymie looks perfect! Stymie the racehorse was born in 1941 and was one of the most well-known Thoroughbreds in his day. Out of 131 lifetime starts, Stymie won 35, placed in 33, and showed in 28! His career winnings were $918,485, which made him, at the time, the richest racehorse in America! Some of his most notable wins were the Brooklyn Handicap (1945), the Pimlico Cup Handicap (1945), the Saratoga Cup (1945 and 1946), the Whitney Stakes (1946), and the Gold Cup (1947). I love how the print looks in this frame – now I just need to figure out where to hang him! He looks great in every spot!